A colorful 16-bit Parodius-style horizontal shoot'em up for 5€. Shooters don't really need a story. Most of the time you're defending your world from an evil alien or robot invasion. 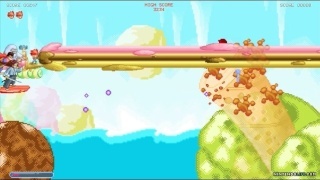 Ice Cream Surfer has five heroes that defend the world from an evil Brokkoli guy. Yes, the developers tried to put their crazy ice cream, vegetable, human, animal, chimeras, and random-thing characters in a consistent universe. 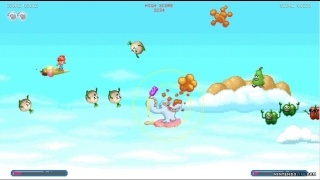 Through gameplay it manages to create a colorful universe of funny animation and wonder, but it falls short when it tries to explain itself in both the intro cutscene and the comic that is available on icecreamsurfer.com. Six autoscrolling stages await you (and a friend in twoplayer co-op). Select from five heroes, each with his/her own weapon and special attack. Move around the whole screen, avoid enemies and their bullets, mash your fire button (no holding fire), and occasionally unleash a devastating (or totally useless - depending on the character) special attack. 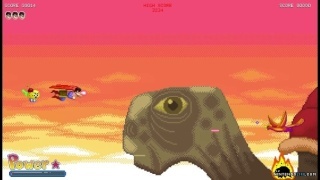 Beat a boss at the end and move on to the next stage. Defeated enemies leave items to pick up. Most common are crystals for extra points, and different colors of ice cream for better weapons, shields and a few other effects. Not so common items are 1-Ups and hidden I-C-E-C-R-E-A-M letters that unlock concept art in a gallery. There's just one difficulty level (no options, no settings, just 3 lives and unlimited continues): It isn't too high, but the tiny enemy bullets are easily overlooked with your fast moving characters, the colorful chaotic backgrounds, and the flood of enemies, explosions and crystals zipping by. This will initially, eventually take away a few lives. At least until your eyes get used to what is dangerous and what is not. Once you beat the main game you can select each level from a stage select option. Another thing your eyes need to get used to is the heavy slowdown with a fully charged weapon on rapid fire and a screen full of stuff flying around. Some people are directly drawn into a nostalgic blast from the past that needs to be exploited. Others cringe as they want their 60fps at all times, especially in a simple 2D Wii U game. The presentation is ok with Off-TV-Play being usable and music coming from the GamePad (at least in the stages). But it's an unpolished experience as the menus are glitchy. I cannot comprehend as to why certain sound effects come from the tv speakers, or why wrong menus pop up, as there aren't many menus anyway. It's simply another case of miserable game testing. Here is a weird glitch though: Normally, after beating a boss you get to see a stat screen (crystals collected, enemies defeated, letters collected), but sometimes it pops up for less than a second before it goes black and back to the loading screen. Completionists need this data to unlock everything in the gallery. It's bad enough that there are no indicators of what is needed (or already done) to unlock a certain concept art, but taking away the stat screen in half of the stages isn't nice. If you want a decent SNES-style shmup for two players this game is worth a look and definately fun. Unbalanced playable characters, unpolished menus, and stupid glitches pull down the score though. And why is there no simple offline highscore list? A few more stages and unlockable characters would have helped adding some value too. Good review. High potential, but poor execution equals a mediocre game. I'm still gonna download this when it releases in my region! Ice Cream Surfer is fun, but I agree with SKTTR that the game is blemished by a few technical issues. There was a mistake I made upon game testing, as I couldn't see the ending in 2p mode. The problem seems to be that the final boss needs to be defeated in a certain pattern, otherwise it's like a Game Over and you have to restart the stage. The developer wrote on Miiverse that you have to defeat the boss "when he uses his moustache" to see the ending. I edit the review accordingly. Great review my friend! I really appreciate your hard work in providing new reviews on a regular basis. I think that I shall pass up this eshop title.